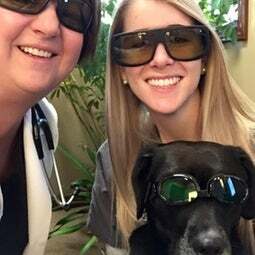 Laser Therapy | Country View Pet Hospital Inc.
Our laser therapy is great to help add comfort to your pet's life! This simple therapy feels like a massage to your pet and is great for any condition requiring help with inflammation or healing. We use the therapy laser post-operatively and in common conditions like arthritis, wounds, and more. Our special thermal imaging with our Digatherm camera helps us to pinpoint areas of concern to better tailor your pet's laser therapy. Call us today so we can discuss how tailored laser therapy can benefit your pet and help decrease- or stop- your struggle with giving daily medications.